If you plant lily of the valley, you had better love lily of the valley. And your neighbour had better love it, too. If not, your neighbour had darned well better love you. Lily of the valley (Convallaria) is a plant that doesn’t do things by halves, and it’s no respecter of fences. Given the right conditions (it doesn’t ask for much; light soil and a little elbow room will do), it will march right through your garden… and into the next one. It falls into the category of invasives. With these, you should be careful when you plant it, and where. Goutweed (Aegopodium podagraria) is the classic example of an invasive plant. If someone offers you a snippet of this pretty, variegated groundcover, back off and keep running. Unless it’s kept firmly contained, such as in a concrete planter, it’s everywhere, including your neighbour’s yard, within a few years. There are some very useful groundcovers that can still be poor neighbours, if your neighbour is a wild space. 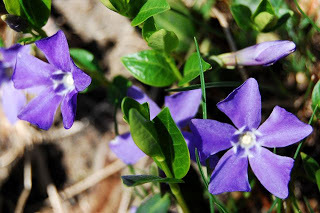 In a city garden, far away from such things, the periwinkle or Vinca is one of the few perennials that will reliably give you flowers (including white, purples and the eponymous periwinkle blue) as well as foliage (including some with variegation) even in dry shade. Or, at least, will give you these “once established.” They require attention to watering until they do. However, if you’re living at the edge of a ravine, periwinkle is likely to sneak off and join nature’s circus, hogging the limelight (and nutrients and space) from more deserving native plants. So, periwinkle + ravine = bad neighbours. 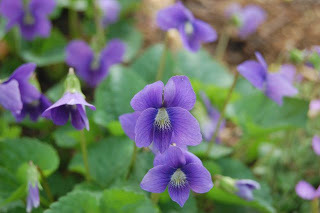 Likewise violets (Viola). They’re no shrinking violets when it comes to self-seeding with great energy and enthusiasm. In my dry shade garden, they’re very happy and very welcome. In my friend S.’s ravine-side plot, not so much. Although I advised her when she bought the place to embrace her inner violet (knowing she’d have to live with them a while), S. is doing absolutely the right thing by yanking up the violets whenever they appear. Same equation applies. By the way, never, ever plant goutweed near a ravine or other native habitat. Please, think about where your plants might spread before you introduce them to your garden. And do your research before you install those free giveaways from someone else. The good-neighbourliness you save might be your own. I dug some Lily of the Valley from my Aunt Janie. I was fretting about it not growing. Now I laugh at my fretting – and your label for the post . . love/hate. Oh, those lilies can grow. I find the lily of the valley a lot easier to control than goutweed. 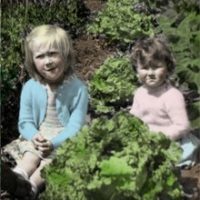 I had the worst time removing the goutweed planted by the previous owners. I dug it out, and it spread under the sidewalk and up on the other side. In the lawn, I mowed their heads off every week, and still they popped back up every week for the entire summer. I had to pry up the sidewalk blocks to get the goutweed runners out from underneath, grr. With lily of the valley, when I pulled it up, or mow it, it is gone for the season. However I wouldn’t plant it next to any delicate plants. Goutweed is so invasive it will push back established Quack-grass. 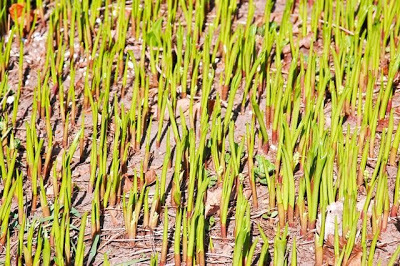 And quack-grass is no slouch. It’s rhizomes know no bounds and it puts out something that actually inhibits other plant’s growth. Seeing goutweed push it out of the way is almost unbelievable. One thing I forgot to mention about goutweed: don’t let it go to seed. The spreading rhizomes are bad enough, but this member of the carrot family also propagates by seed, too. That’s another reason why it seems to jump barriers. However, I’ve said it before and I might as well repeat it her: I am a woman who has killed goutweed, unintentionally. So perhaps I should hire myself out. I could make millions! What exactly is Quack Grass, wiseacre? I can never keep all these annoying grasses straight. That’s funny about goutweed giving it the push. One thing I discovered today is that Lamium seems to self seed prolifically too. I thought all these little volunteers I’ve been noticing might be something interesting, but I think what I’ve got is a case of burgeoning lamium. Luckily it’s pretty easy to pull out too, and it does bloom a long time. we spent a long time digging out bamboo and our new neighbors came in and planted some on the fence line. hah! interesting post. thanks for the ideas.